» Florida is 31-10 in 13 NCAA Tournaments under Donovan and has reached at least the Elite Eight in five of the last eight (two national titles). 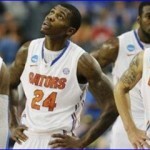 The Gators advanced to the Elite Eight for the third-straight year with a 62-50 win over FGCU on Friday. Florida has lost consecutive Elite Eights and, should it lose on Sunday, would be the first team in the history of the tournament to drop three-straight regional finals since the event expanded to 64 teams. 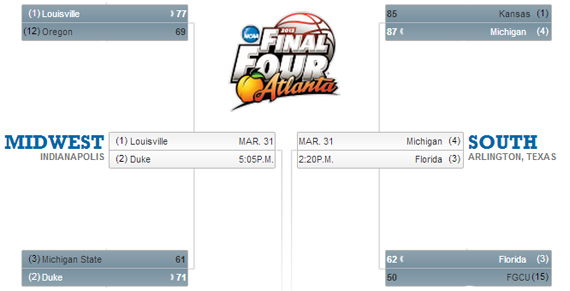 The Gators have not advanced to the Final Four since 2007. » Donovan’s 31 NCAA Tournament victories are the most by any SEC coach. » UF Is looking for its third 30-win season in school history. » Florida is 54-7 since the beginning of the 2011-12 season when holding opponents under 71 points in a game (28-6 in 2012-13). » The Gators and Wolverines each have four starters that average in double figures with Michigan having two that average 14.8 points per game or more. No one on Florida averages more than 12.6 points per contest. » UF is 4-1 against top-25 opponents this season after going 3-5 against ranked adversaries last season with all five losses coming to top-three teams. » Florida is 0-6 this season in single-digit decisions while UM is 8-6 (2-1 in overtime). » The Gators are ranked first nationally in scoring margin (+18.1), third in scoring defense (53.7), seventh in field goal defense (.379), 13th in field goal percentage (.480), 18th in three-pointers per game (8.3) and 24th in assist-turnover ratio (1.32). Florida is also seventh nationally in fouling (14.1) and 214th in free throw percentage (.681). » The Wolverines are first nationally in assist-turnover ratio (1.55), sixth in field goal percentage (.486), 12th in scoring margin (+12.4) and 23rd in scoring offense (75.4) and three-point percentage (.381). Michigan is also second nationally in fouling (12.7) and 13rth in free throw percentage (.705). 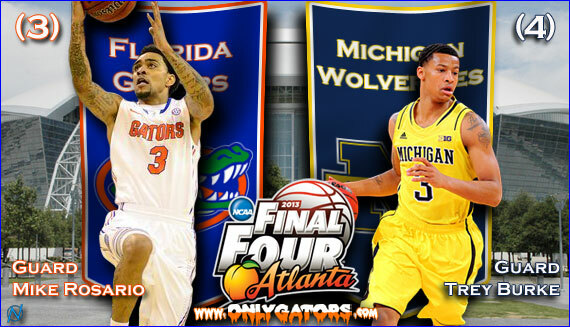 Read the rest of the Florida-Michigan gameday preview…after the break! The Gators are looking to get over the Elite Eight hump that has caught them in each of the last two NCAA Tournaments and their journey continues with Donovan going up against an old foe in Beilein. Florida boasts one of the most efficient offenses and top defenses in the nation but will be going up against an explosive Michigan offense that boasts some of the top scorers in the nation. A victory would advance the Gators to the Final Four for the first time since 2007, while a defeat would make Florida the first team in tourney history to drop three-straight Elite Eights. » Redshirt senior guard Mike Rosario (#3) has really come into his own for the Gators in the postseason, leading Florida in scoring in each of the last two games by averaging 20.0 points per contest. Rosario is 10-for-19 from downtown in the NCAAs and has morphed from a defensive liability to a player that Donovan can depend on most nights. Though he will not be assigned to Michigan’s top player, Rosario will have a difficult defensive match-up as he attempts to guard UM’s athletic perimeter players. UF’s top scorer (12.6 points per game) has yet another tall task ahead of him on Sunday. The Wolverines had a long road back from crippling NCAA sanctions that were handed down in 2002 and wiped out much of the team’s success in the 1990s. Michigan is finally back on top of college basketball and has been one of the top teams in the nation all season. Though many saw UM as just one of the Big Ten’s best teams, it is the only one still alive in the NCAA Tournament and will be looking to reach the Final Four for the first time in decades. The Wolverines have a young team that will be going up against a veteran Gators squad but the talent is there for them to pull off the upset. » Sophomore G Trey Burke (#3) has been an offensive juggernaut for Michigan all season and is his team’s leader in scoring (18.9 points), assists (6.8) and minutes per game (35.5). Burke is also UM’s best free throw shooter (.803) and hits nearly 39 percent of his threes. After being held scoreless in the first half against Kansas, Burke exploded in the second half and hit a 30-foot trey to force overtime. He finished with 23 points and 10 dimes, catapulting the Wolverines into the Elite Eight. Florida junior point guard Scottie Wilbekin will be assigned to try and contain Burke over the course of Sunday’s game but will certainly have a tall task ahead of him. Though Wilbekin did not speak to the media on Saturday, Donovan discussed what the Gators will have to do against Burke in order to be successful. “If we don’t have enough help built in around Burke with him coming off screens, using screens, it makes it very, very difficult for any defensive player to handle a guy like that. So you know that Scottie is going to work hard on the ball. He’s going to work hard on getting all the screens, but he’s also going to need help, too, inside of our team. And we’ve got to make sure we give him that built in help [Sunday],” he said. Florida had not done much work on Michigan from a film perspective when the players spoke with the media on Saturday, but Gators junior center Patric Young noted that he was impressed with what freshman forward Mitch McGary had done so far in the NCAA Tournament for the Wolverines. In Michigan’s first three games, McGary has averaged 19.7 points and 12.3 boards while shooting an incredible 75.7 percent from the field. Senior guard Kenny Boynton continues to make waves in his fourth year as a starter for the Gators. He is quickly climbing his way up many of Florida’s all-time lists and is already first in school history in five categories: three-point field goals made (331) and attempted (975), field goal attempts (1,663), career starts (141) and minutes played (4,640). He currently leads the SEC in career points (2,020) and three-pointers among active players and is sixth all-time in SEC history in career three-pointers made. Also, don’t forget that many of these players where around last year when they almost beat Cuse at Cuse. These guys have seen the zone before, and Yeguete and Prather are playing better now and would be helpful for breaking down the zone. Probably not a good idea to look ahead. Just being hypothetical. We have a hard game ahead of us today. The 42K won’t even be filled. Take Murphy off of the floor! No hustle, no desire…waste of space! Very surprised that this team came out with no heart or hustle today. Wasn’t the coaching. Second, third, fourth chance opportunities for Michigan, steals and no effort from our leaders. Oh well, maybe next year…now I know how the Buffalo Bills fans feel.